Thomas's lyrical harp, the clarity of Kerstin's expressive voice, Ian's sensitive guitar work, along with vocal harmony and compact arrangements, blend to create a uniquely evocative and emotionally powerful sound: Celtic acoustic music which successfully merges the traditional and the modern. As a trio or as a septett, featuring Clannad founding members Noel and Pádraig Duggan and Riverdance fiddle player Máire Breatnach, the group has performed all over Europe, Canada and the USA. 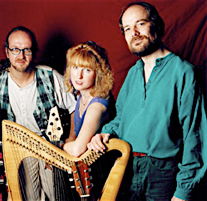 The magic of the Celtic harp is central to the sound of Norland Wind. The landscape and music of Donegal, the Celtic northwest of Ireland, provides the inspiration for many compositions of the trio. Haunting harp instrumentals written by Thomas Loefke or by Clannad lead guitarist Ian Melrose alternate with Gaelic and Anglo-Irish songs mostly composed by singer/guitarist Kerstin Blodig.